For years, industry experts have demanded an improved standard to replace EN 779. Critics of the standard call attention to its highly unrealistic test conditions and test results with limited relevance to real-world performance. ISO 16890 provides lab evaluation procedures which more realistically simulate actual operating conditions, replacing the old standard's filter classes G1-F9 by a classification system based on particulate groups PM1, PM2.5 and PM10. These same particulate categories are used by the World Health Organization in evaluation of environmental air quality. EMW’s air filters get tested and classified according ISO 16890. We offer you a huge range of different ISO 16890 air filters. 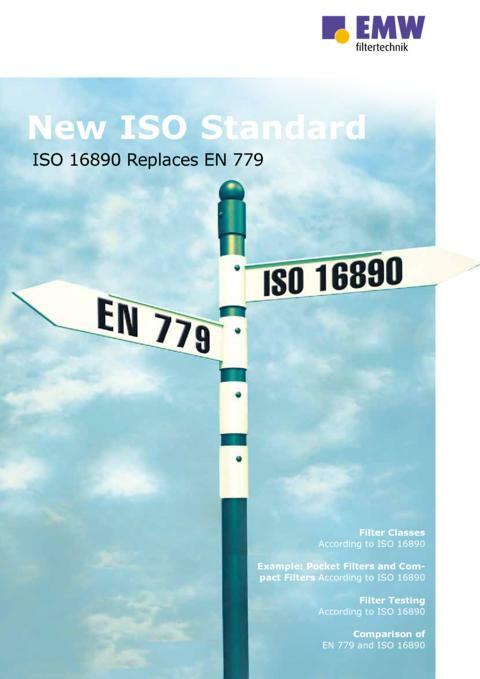 Unlike EN 779 which specifies Filter Classes, ISO 16890 classifies according to Filter Groups, evaluating a filter's performance by its arrestance of particles from 0.3 to 10 μm in size. Filter Group PM 1 comprises particulate sizes ≤1 μm, PM 2.5 includes particulates sizes ≤2.5 μm and PM 10 covers particulate sizes ≤10 μm. For filter experts, the key difference is clear: The old standard tests arrestance of only one particulate size (0.4 μm). The new standard determines arrestance over a spectrum of particulate sizes. This clip shows you how a filter gets tested according ISO 16890. An air filter qualifies for Filter Group ISO ePM1 or ISO ePM2,5 if it achieves a minimum efficiency of 50% or greater for particulate sizes ≤1 μm or ≤2.5 μm. Along with the Filter Group achieved, the complete ISO 16890 classification also includes the filter's average efficiency . Minimum efficiency is defined as the efficiency achieved following electrostatic discharge of the filter before testing. Average efficiency is calculated by averaging the filter's efficiencies in the untreated state, i.e. before discharging, and in the discharged state. More information in this regard is provided in the section below entitled "Filter Testing According to ISO 16890". For example: if a filter achieves a minimum efficiency of 45% in the PM1 size spectrum and 56% in the PM2.5 size spectrum, it does not qualify for the ISO ePM1 Filter Group – having missed out by 5 % – but does qualify for the ISO ePM2,5 Filter Group. Assuming that the average efficiency achieved by this filter for ISO ePM2,5 particulates was 68%, this percentage is rounded down to the nearest 5% increment (i.e. rounded down to 65 %) and the filter’s ISO 16890 classification is therefore ISO ePM2,5 65%. To be classified in Filter Group ISO ePM10 a filter must achieve an average efficiency of ePM10 ≥ 50 %. Filters with an average efficiency < 50% for this particle size range are classified in the Filter Group ISO Coarse and according their initial gravimetric arrestance. The following table shows results of a pocket filter which got tested according to ISO 16890. Which ISO Filter Group classification is achieved by the filter above? With which efficiency rate gets the ISO ePM2,5 filter above finally rated? Perfect! You are a real filter expert! 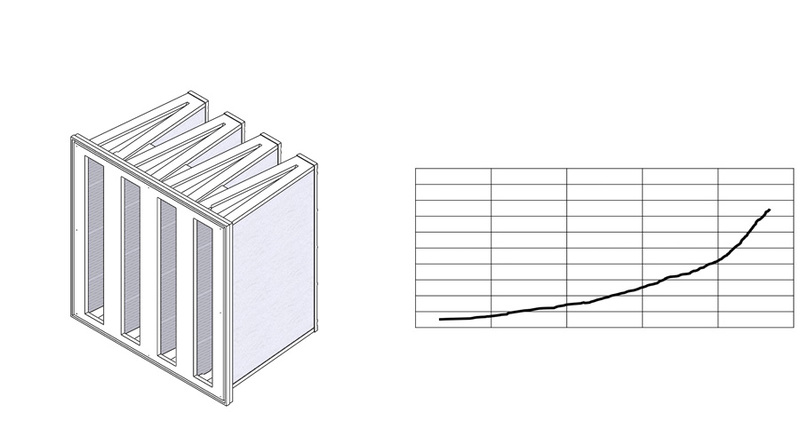 The ISO 16890 classification of the filter in Example 1 is therefore	ISO ePM2,5 65%. The following table shows results of a compact filter which got tested according to ISO 16890. Sadly wrong! The minimum efficiency must be at least 50%. Furthermore the highest possible filter group has to be chosen. With which efficiency rate gets the ISO ePM1 filter above finally rated? Sadly wrong! 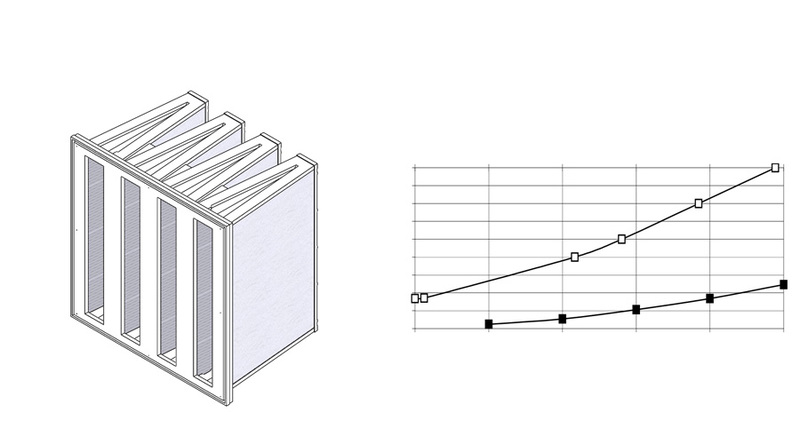 Classification is based on the average efficiency, which is rounded down to the nearest 5% increment. 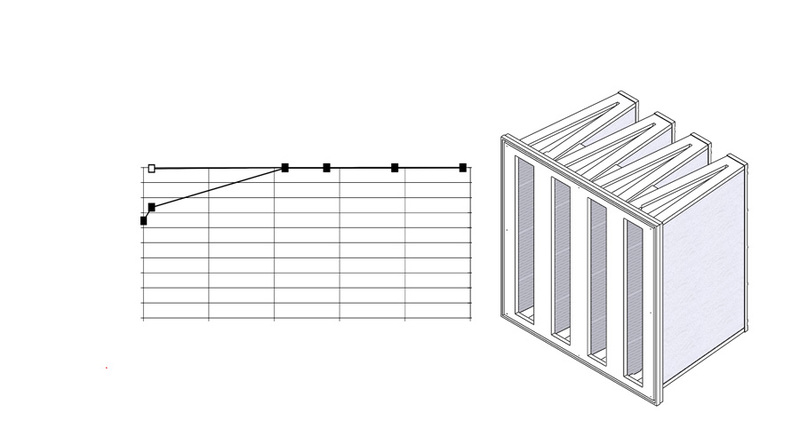 The ISO 16890 classification of the filter in Example 2 is therefore ISO ePM1 85%. 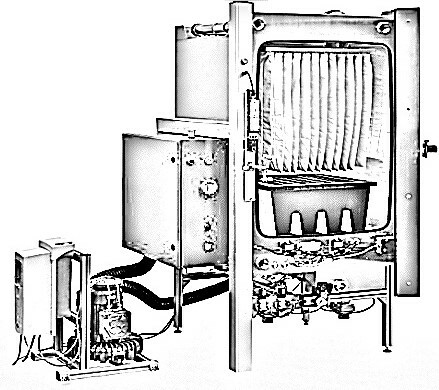 Along with the new filter-group based classification system, ISO 16890 also incorporates changes in test procedures. 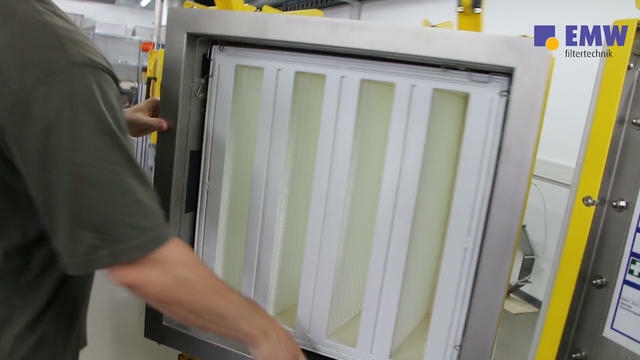 The new standard specifies two test phases for evaluation of air filters. In Phase 1 of the testing, the pressure drop across the filter is determined as a function of volumetric air throughput. Then the filter's fractional arrestance is determined over a particle size spectrum of 0.3 μm - 10 μm. Two different test aerosols are used in the testing: DEHS (di-ethylhexyl sebacate) aerosol for particulate sizes up to 1 μm and, for larger particulate sizes, KCl (potassium chloride) aerosol. Phase 2 of the testing concentrates on the filter's performance without the distorting effects of electrostatic charge. A filter which is charged with static electricity will achieve increased arrestance – for instance in laboratory testing. In actual field service this increase is only a temporary effect which quickly disappears. For this reason, test data determined on electrostatically charged filters does not truly relate to real-world performance. Therefore, in Phase 2 the filter is electrostatically discharged in a treatment chamber before its arrestance and pressure drop are again determined under more realistic conditions. The results of both test phases are then averaged, providing the average arrestance for each of the fractions PM1, PM2.5 and PM10. Before the filter is classified in an ISO Filter Group, its arrestance results are weighted using theoretical particle size distributions for urban and rural air. The ISO Filter Group classification is done in accordance with these weighted arrestance results. In the case of ISO Coarse filters, testing of dust retention capacity is mandatory as stipulated by ISO 16890. For all other Filter Groups this is an optional determination. The testing particulate specified for use in the dust retention test is Test Dust ISO Fine. No, there isn't, we're sorry to say. 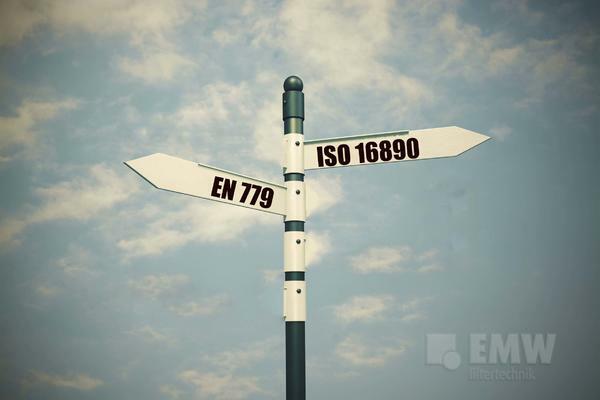 The testing and evaluation procedures of ISO 16890 and EN 779 differ greatly. We therefore cannot recommend use of tables or calculations which claim to convert G1-F9 Filter Classes into ISO Filter Groups. A number of such conversion tables are available; however there are major differences between them. The following comparison shows how filter classes according EN 779 could be converted in filter groups according ISO 16890. Filter Classes M5-F9: Only arrestance of particulates 0.4 μm in diameter Classification is based on arrestance of particulates in the diameter range 0.3-10 μm. This applies for all ISO Filter Groups.